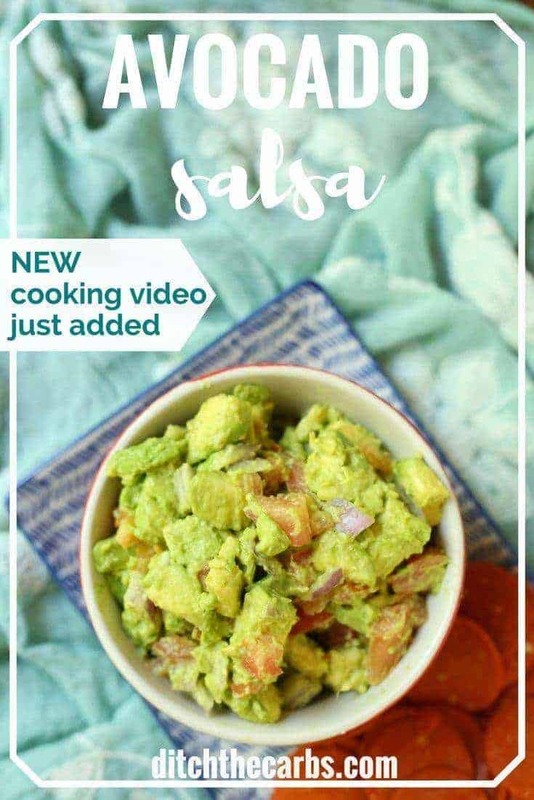 Avocado salsa is colourful, nutritious and such a fabulous way to eat avocados and all their healthy fats. Avocados are one of the top 10 low-carb snacks. Take a look here for all 10. Avocados are such a perfect food, due to their mono and polyunsaturated fat content, nearly 20 vitamins, minerals and beneficial plant compounds. Avocados contain oleic acid, folate, iron, niacin, minerals, Vitamin E, Vitamin C, healthy fatty acids, and a great source of fibre. They are great for the skin, and great for weight loss. As we know, increasing our good fats, reduces hunger, increases satiety and improves nutrition. Avocados always appear in the Top 5 Nutrient Dense Foods. For years I would avoid avocados because of their fat content, or allow myself a small slice. Now I will sit an eat an entire avocado, cut in half with salt, pepper and olive oil. How nourishing is that? Or how about filling it with a tin/can of tuna in love oil. Simple is good. So much better than some low fat nonsense. Add avocados to salads, crack an egg in the hole the stone leaves behind then grill them, have with bacon, use them instead of butter, I have even made a chocolate mousse, chocolate mint ice-cream and a beautiful way to top of my Fat Head taco cups. Avocado salsa is more chunky that guacamole. You can have it as a side dish, as part of low-carb platter, as a dip for vegetable sticks, in lettuce wraps, on bunless burgers, or just on its own. I often make a double batch then I can pack it for lunch. Avocado salsa travels well in small pots for lunch boxes (remember to put a spoon in the lunchbox). If you want to know the correct way to cut avocados before making the avocado salsa, watch this. Who knew I cut avocados completely different to anyone I know? To see the nutrition in avocados, click here. 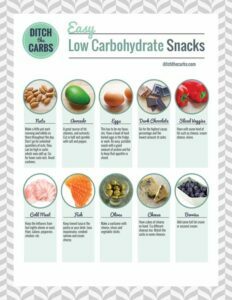 These are the top 10 easy low carb snacks. A great FREE printable for the fridge and an easy reminder to stay on track. Just click on the image below to save the PDF for printing. 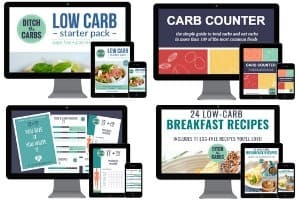 If you are new here, you may wish to see my low-carb FAQ and diet sheet. A great way to get started today. Hello, will the avocado salsa be fine if packed for lunch? Say, I prepare it the day before and take it for lunch the following day, will that be okay? Is there a particular method you use to keep if fresh? I make sure I use a squeeze of lemon to help prevent it turning brown. I also pack it in my children’s lunch boxes using a small container filled to the brim so there is as little air in there as possible. That seems to really work well. I add feta as well. Soooo good!!! Love this recipe. I generally make it for a dinner salad, it’s so fresh tasting and has lovely textures with the smooth velvety advocado and the crunchy red onion. By the time we have had a big helping of this with meat we’re full!! Right now avocados are plentiful and cheap, with lots of roadside stalls in our area. Avocados here often resemble bullets. And are expensive. Thanks Emily. Our first batch was eaten in only 1 day.